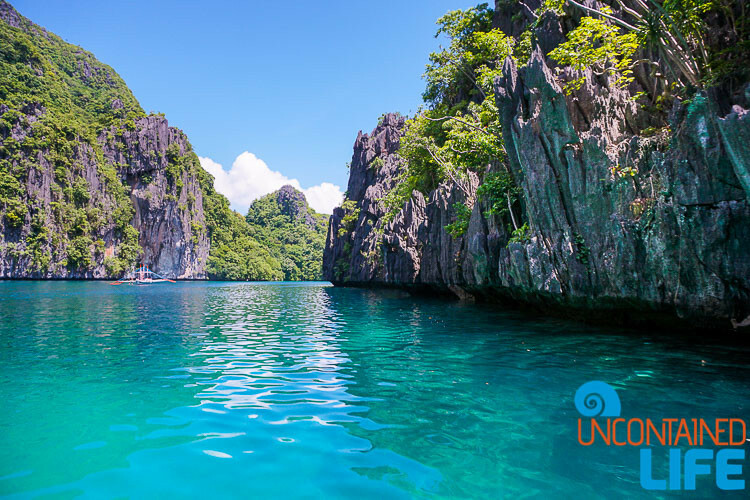 Island hopping and El Nido have become as linked in the minds of visitors to Palawan island in the Philippines as bacon and eggs. (Or, here in the Philippines, adobo and rice.) Call us perverse (go on…we dare ya!) but whenever any activity becomes established as the thing to do in a given locale, our default impulse is to avoid said activity like it’s…oh, I don’t know…a giant spider that appears suddenly in your bedroom. Or something. And thus, on the day of our tour, we left our wonderful guesthouse, St. John’s Island View Pension, in Corong Corang bright and oh-dear-Lord early (I.E. 8am…for those who don’t know me, I believe anything that occurs before 10am is questionable). 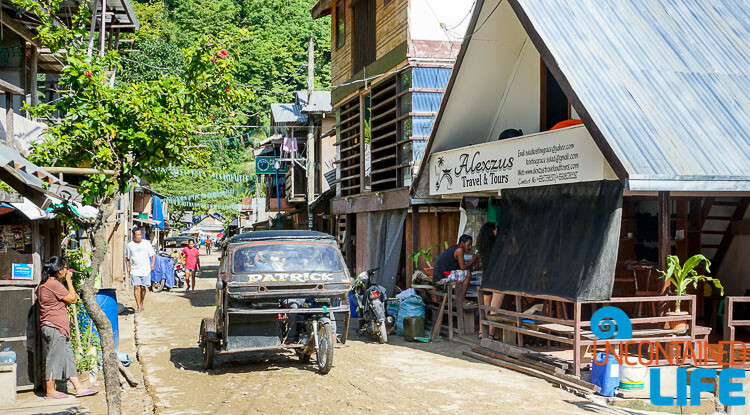 Alexzus Travel and Tours’s office is a little bit off of the beaten track, but given that El Nido town itself is the size of a postage stamp, any local driver should be able to get you there with minimal trouble. 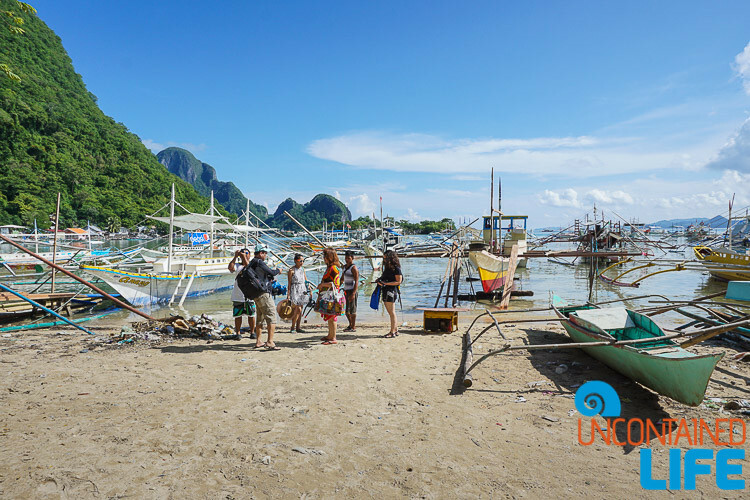 Upon our arrival, we were introduced us to some of the tour company’s guides—a group of young fellas all of whom were friendly and eager to know all about us and our travels in the Philippines as they passed out our snorkeling gear. 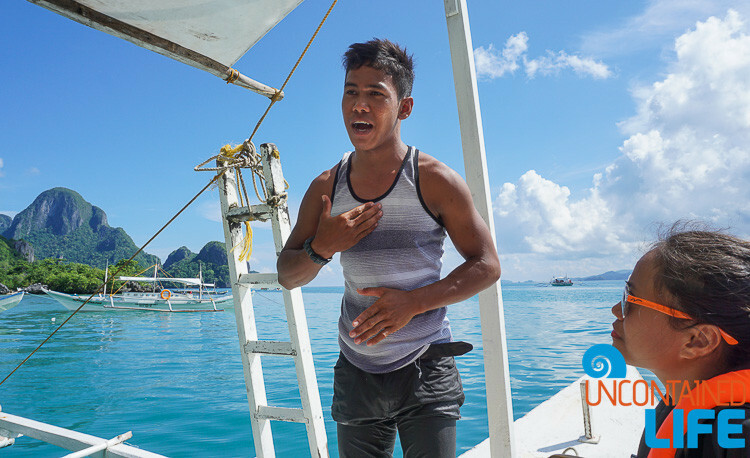 As Kristine explained to us, she and Alex try to choose and train only the best to work with: “Some guides don’t speak English well, or they don’t really want to help the customers; they just sit on the boat at each stop and leave the customers to fend for themselves. 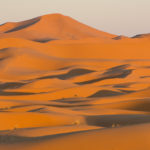 We don’t want to employ those guides.” It certainly seemed to us like she chose well! Let’s get this hopping started! Soon the rest of our tour group arrived. 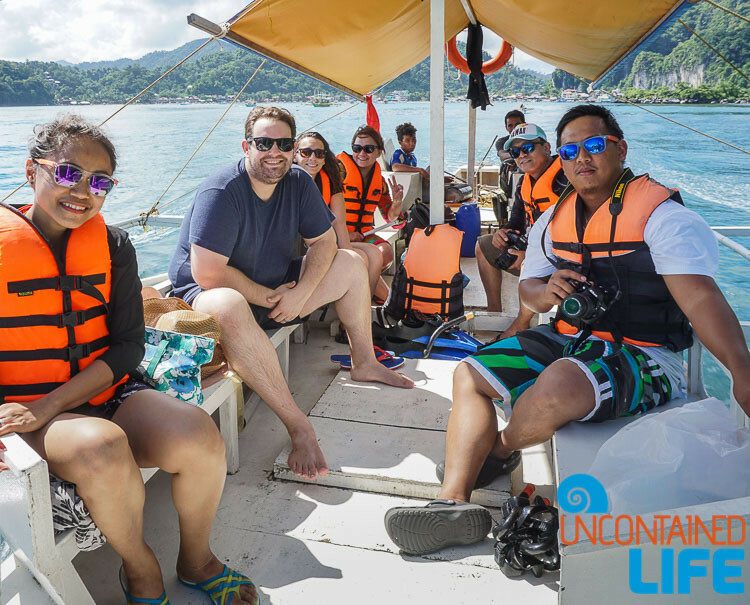 We were very happy to see we were a small bunch—just six of us—Justin, myself, and two Filipino couples— would be traveling together on our island hopping combo A and C tour (a tour which pairs the highlights of two of the four possible tours—tour A, B, C and, you guessed it, D—which are offered by El Nido’s tightly regulated tourism industry). We gathered our gear and followed our guide down to the water’s edge. That’s when we had our first surprise. 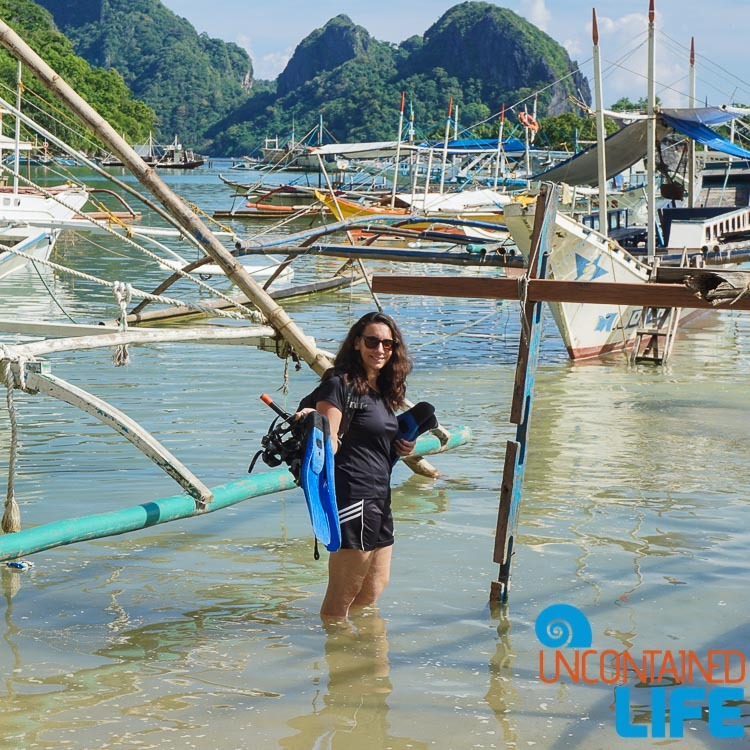 Having been on a number of snorkeling trips in Australia and Hawaii Justin and I figured we were 100% prepared for this new adventure: we had towels and sunscreen; we were wearing our swimwear under our clothes; we had placed our camera gear in our dry bag inside our backpacks… what we didn’t realize, however, is that, in El Nido, your boat doesn’t come to you as you wait comfortably on a dock. So, into the water we all went, clothes and all, following our guides, our bags balanced on our heads. 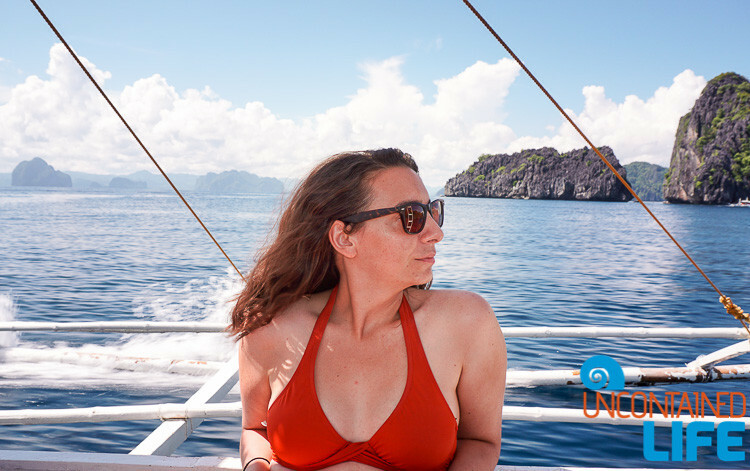 The discomfort of having to then sit on a boat in wet clothes was forgotten, however, as soon as we started out of Bacuit Bay. 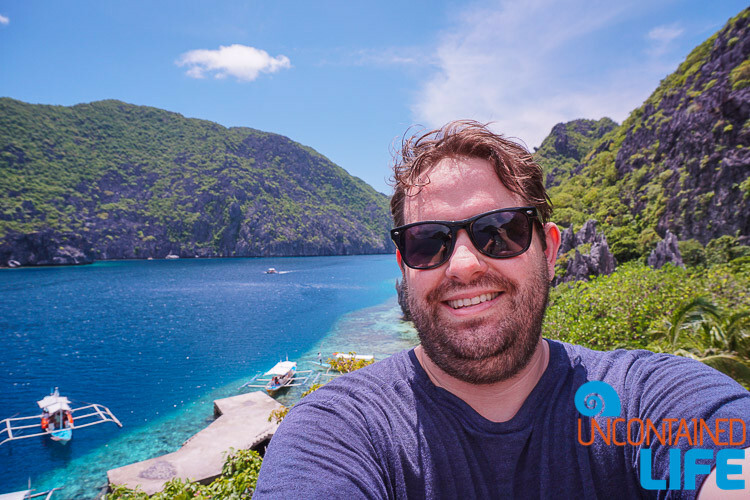 I know that the phrase “crystal clear turquoise waters” is about as cliche as it comes when describing almost any tropical sea…but I’m pretty sure people don’t really understand what that means until they come to this part of the world. 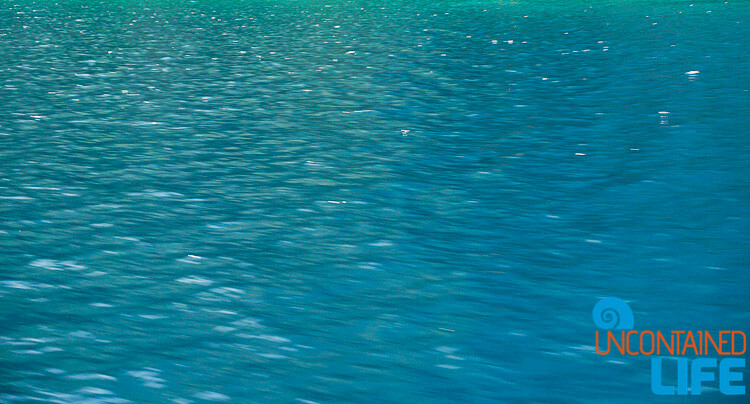 …and down into the crystal clear turquoise waters. Our first stop of the day was Small Lagoon. 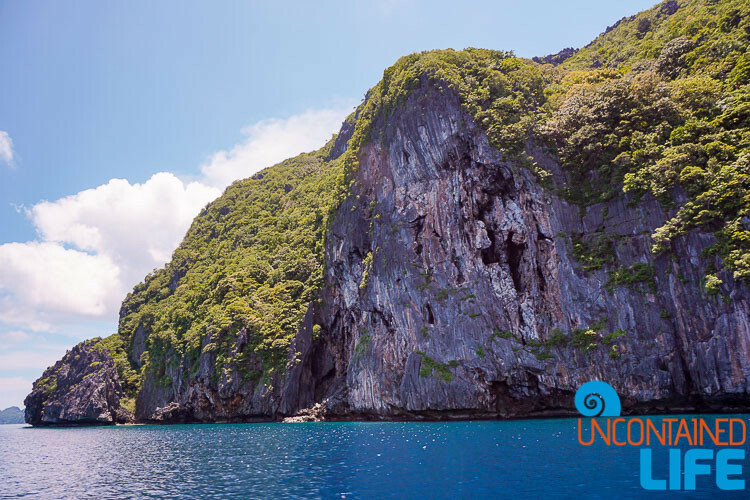 In spite of the fact that the Small Lagoon has very little to see underwater, it is, still, a pretty fantastic place to start an islands tour. 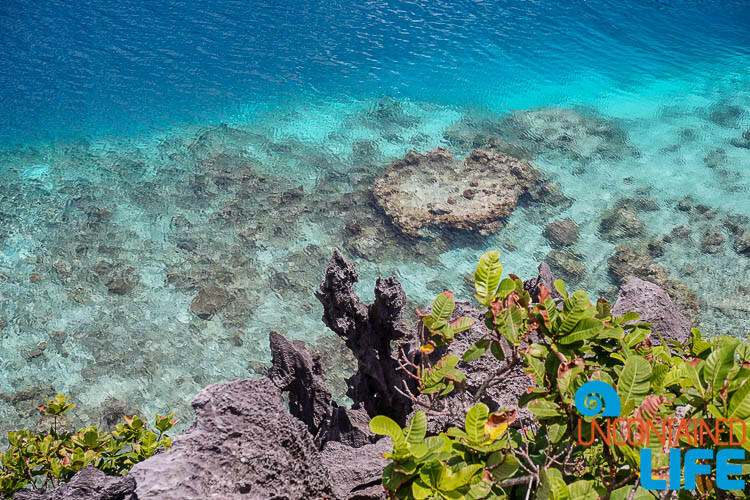 Whether you choose to rent a kayak (for an additional fee) or simply swim around the clear, aqua bay, I think anyone will feel (if they haven’t already) that here they’ve stumbled upon paradise. And that’s before you find even find your way into the actual lagoon! 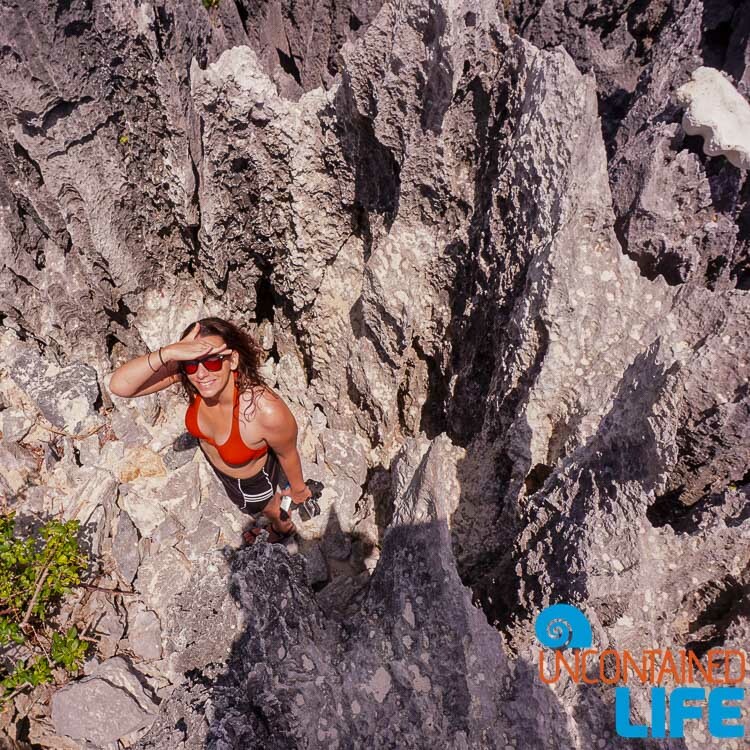 To do that, we needed to make our first (of what will turn out to be several over the course of the day) trip through a narrow opening in the limestone. On the other side we found another beautiful body of water, all enclosed by high, sheer cliffs. 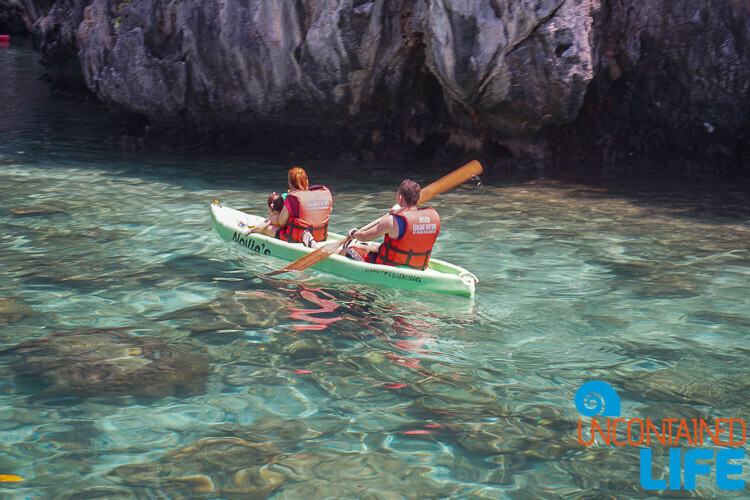 Be sure to take the time to swim across the lagoon and explore the small cave there! Back on the boat, we cruised on over to, and through Big Lagoon. In terms of sheer visuals, Big Lagoon really is extraordinary. 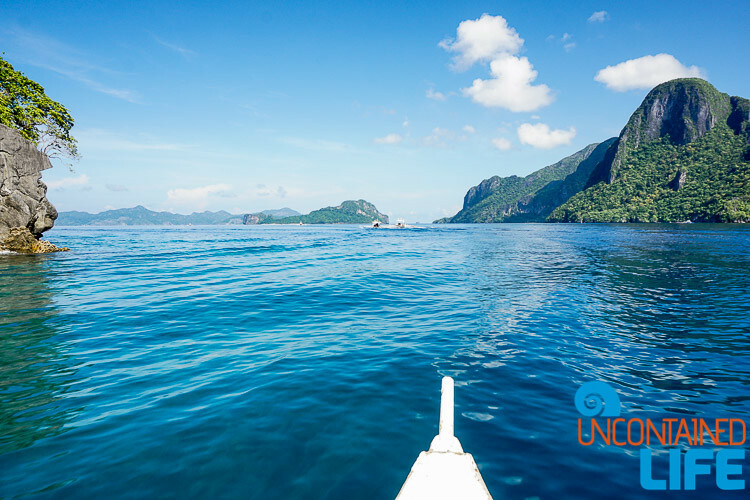 There was no getting out of the boat at this stop, but it was still incredible being able to look down into the water and see everything as clearly as if we were looking through a window pane. After Big Lagoon came the much hyped Secret Lagoon. Unfortunately (and totally proving my aforementioned prejudice) this “can’t miss” place was our least favorite. True, it may have been a different experience if everyone and their mom hadn’t seemed to have arrived to tour the Secret Lagoon at the exact. same. time. Which meant bodies everywhere, often stepping on the live coral (!!!) 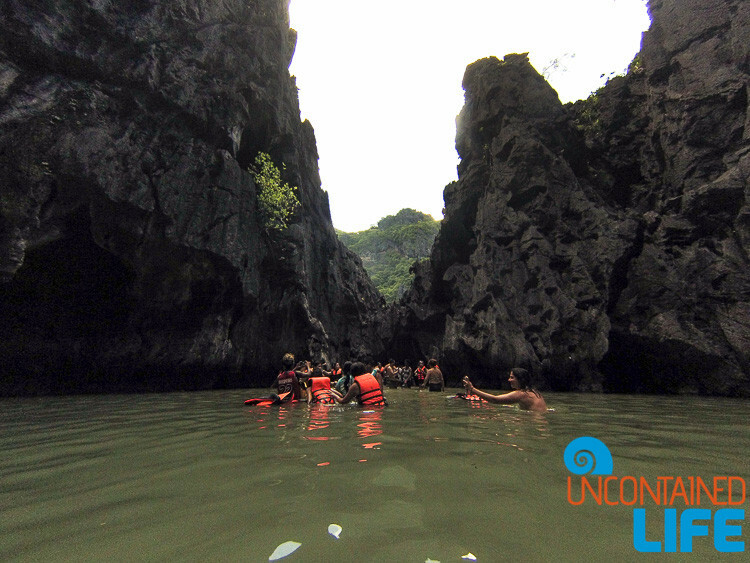 as they queued up to climb through the hole in the rock to get into the lagoon. It was like rush hour. Or, as Justin pointed out as tourist after tourist popped out of the hole, like watching the Orcs swarm out of Mordor. Inside the lagoon, things weren’t much better. The water was dirty-looking from the masses of people trooping in and out, stirring up silt, and the cliffs were not, in our opinion, particularly remarkable. Ah well. Can’t win ’em all! 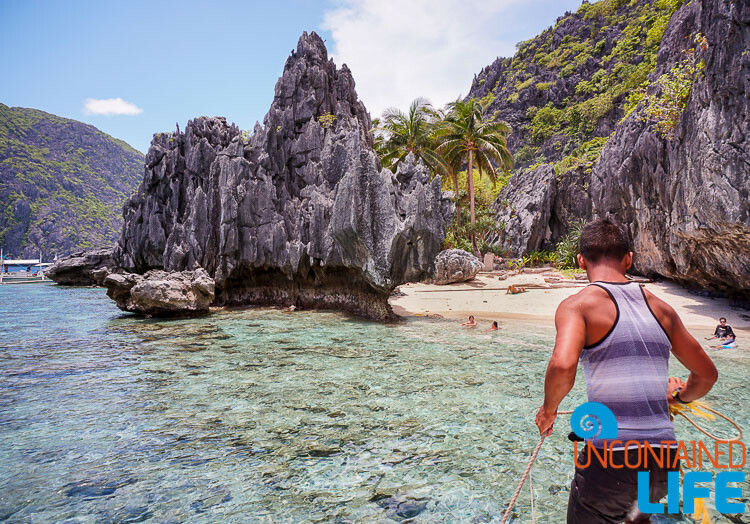 Our next adventure was Secret Beach–a spot which inspired Alex Garland’s novel, (and the subsequent Leo DiCaprio film) The Beach. And Secret Beach really does give you the sense that you’re about to uncover some sort of mystery. 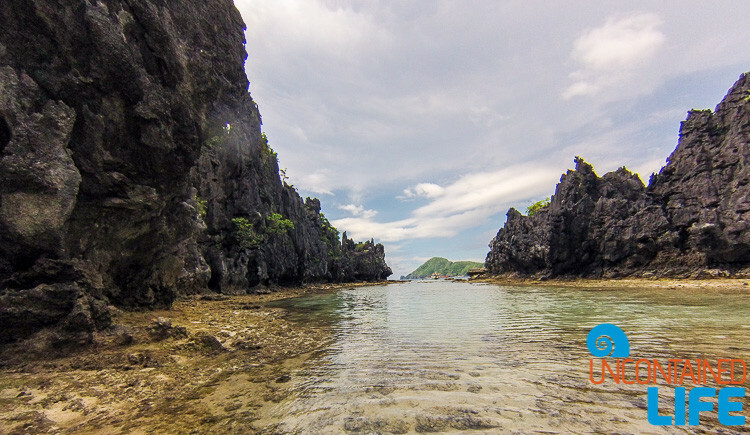 Like the Secret Lagoon, finding the Secret Beach requires that you swim through a small opening in a sea cliff. 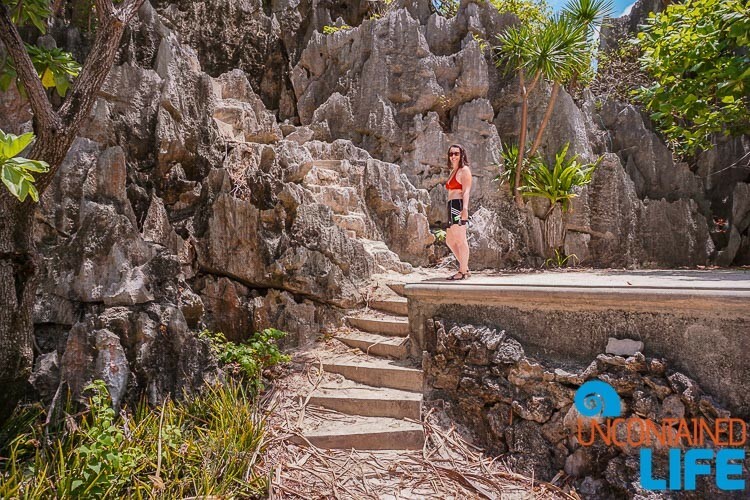 Unlike Secret Lagoon, however, the entrance wasn’t the most interesting part of the site! 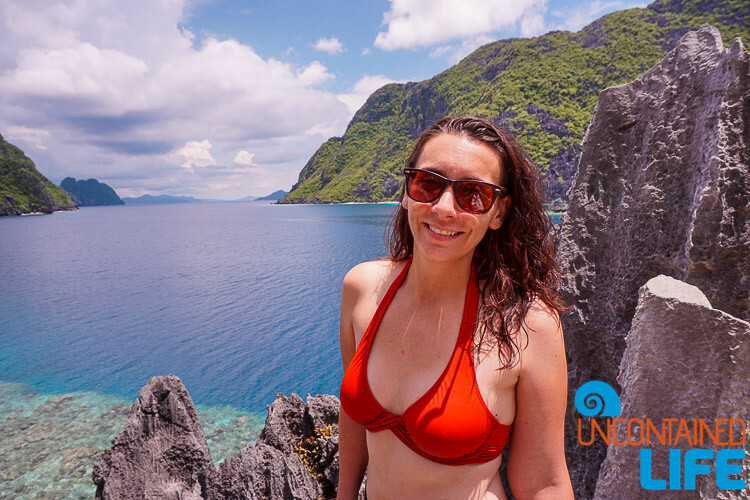 The water leading up to the cliff was the deepest that we’d been in yet–meaning it was also the best spot thus far on the tour to observe some really interesting underwater wildlife, including an amazing school of tiny silver fish! And on the other side of the cliff? 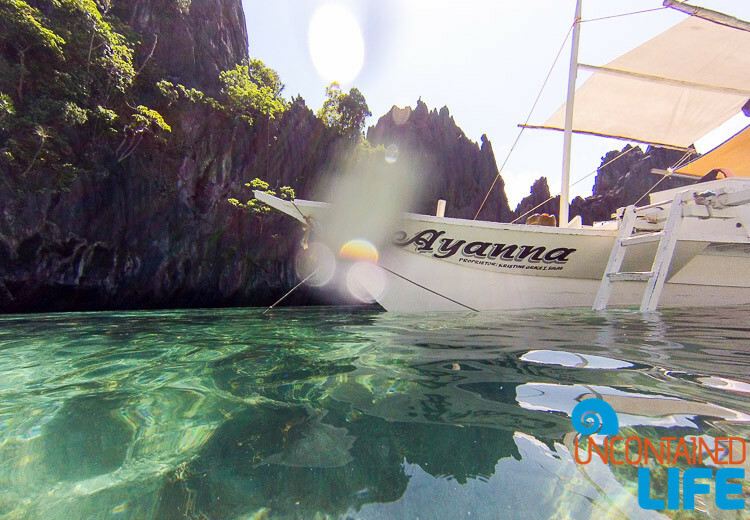 Crystal clear water, and, nestled between the rock formations, a perfect white sand beach! 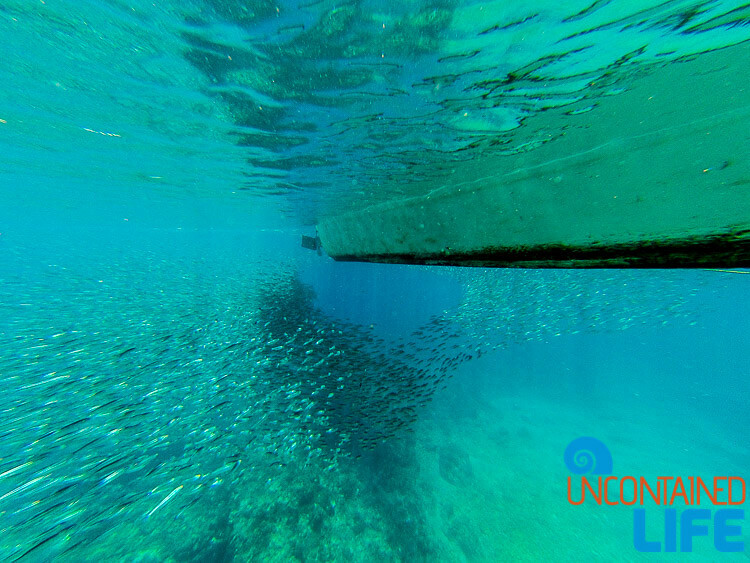 After some time exploring the lagoon and beach, our guide announced that it was lunchtime at last! But first, we had to get to our next destination: Matinloc Shrine. 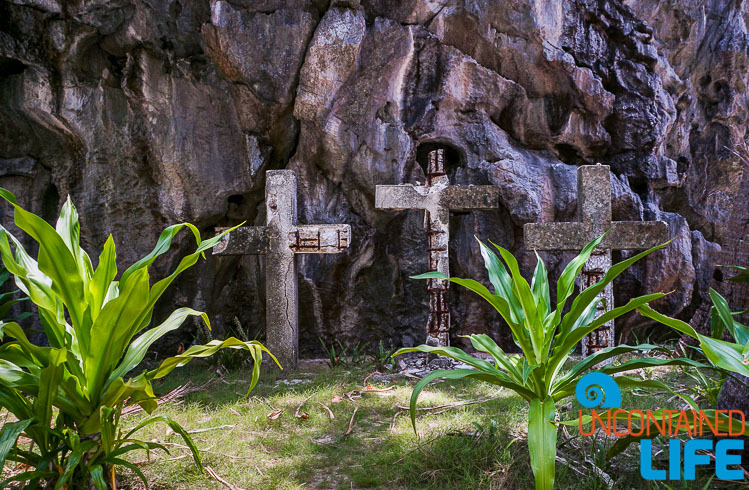 Matinloc Shrine is an abandoned pilgrimage site. 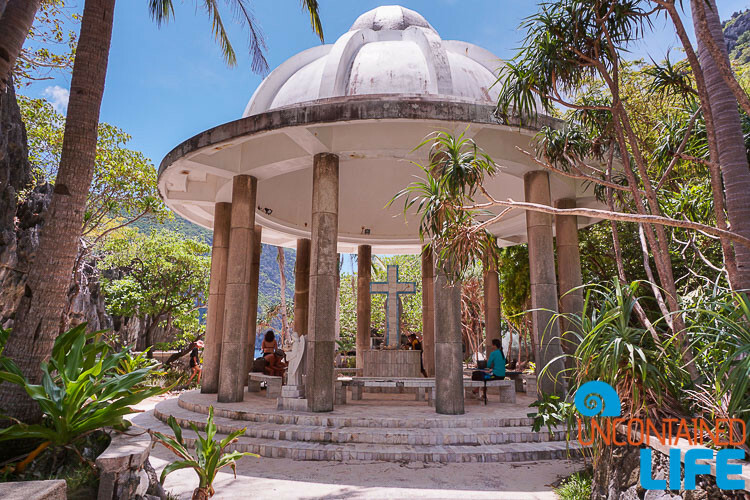 According to our guide, the exact reasons behind the building of the shrine (not to mention its abandonment) remain a subject of speculation amongst El Nido’s inhabitants. 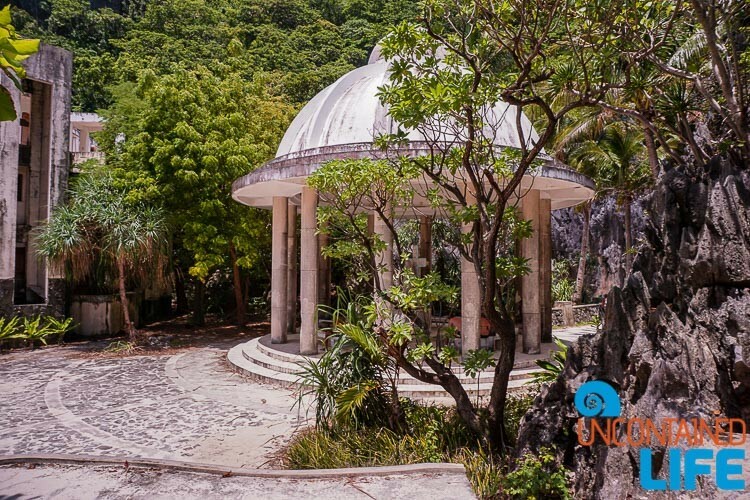 While the official story is that the shrine was built for religious reasons, but was left to ruin when the island’s owners–a Filipino lady and her German husband–separated. 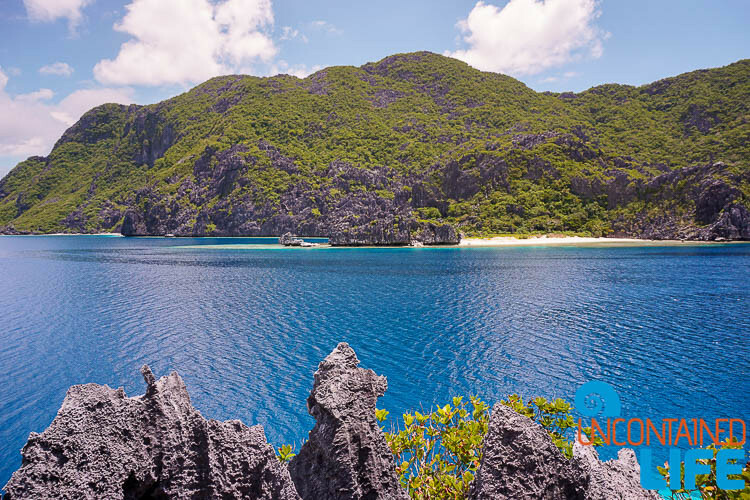 According to rumor, however, the shine was built as a cover for the owners’ true purposes: to harvest the island’s natural resources, in particular, oil. As the crew finished cooking our meal, we explored the shrine and then, climbed up to view the area from above. 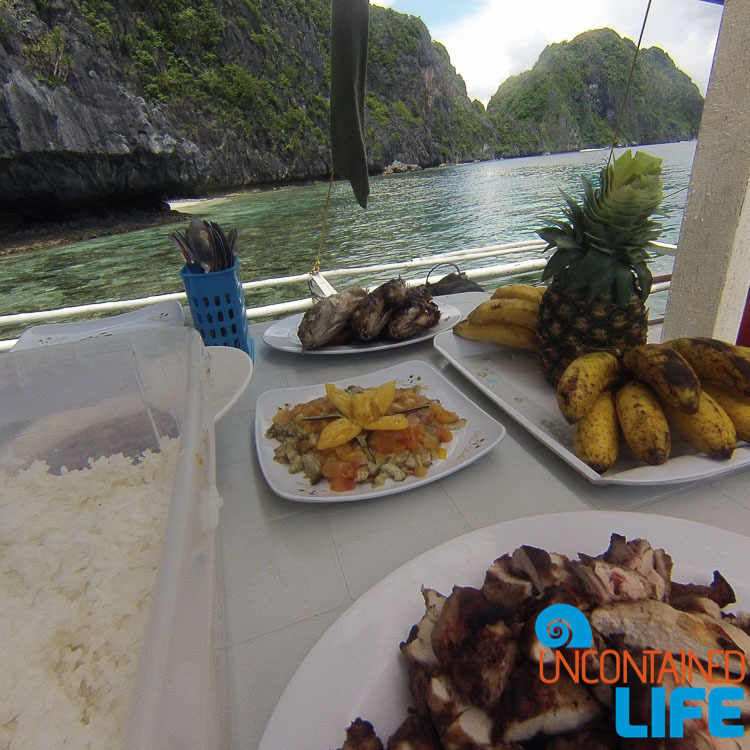 After all parties had (by some miracle) made it down from their spiky rock outlooks unscathed, we enjoyed a fantastic lunch onboard the boat. 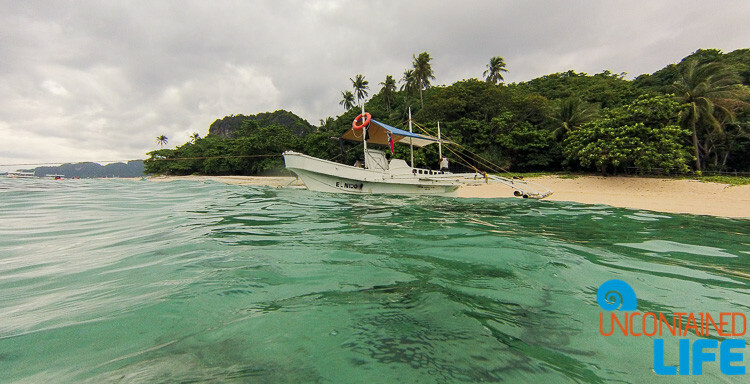 While we we digested our vittles, our crew steered us to our next stop: Hidden Beach. 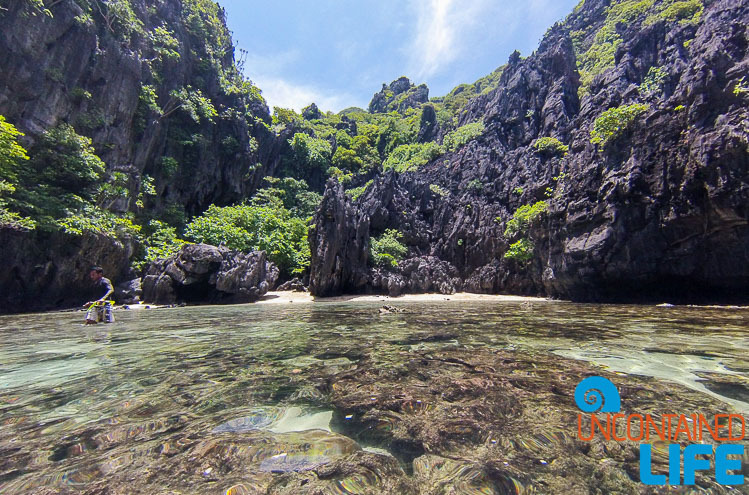 Unlike Secret Beach, Hidden Beach’s “hiddenness” is more of an optical illusion than a fact. 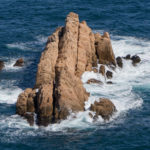 The beach can be accessed on two sides, through two narrow channels–both of which flow, unobstructed to the open ocean. One could definitely miss these entrances, however, especially on the one side where a giant up-cropping of rock in the midst of the channel gives the impression that you’re looking at an impenetrable wall. With our guide to show us the way, however, we swam and walked through the channel to the beach. Once again, the sand was white, but most of the coral in the water appeared dead. Still, there were some signs of life. Here and there, if you looked closely, you could spot anemones, and, inside these frilly creatures, clownfish–indeed, one of the anemones was home to the teeniest tiniest clownfish Justin and I had ever seen! Our final stop of the day was at Helicopter Island (aptly named because it looks like a helicopter). 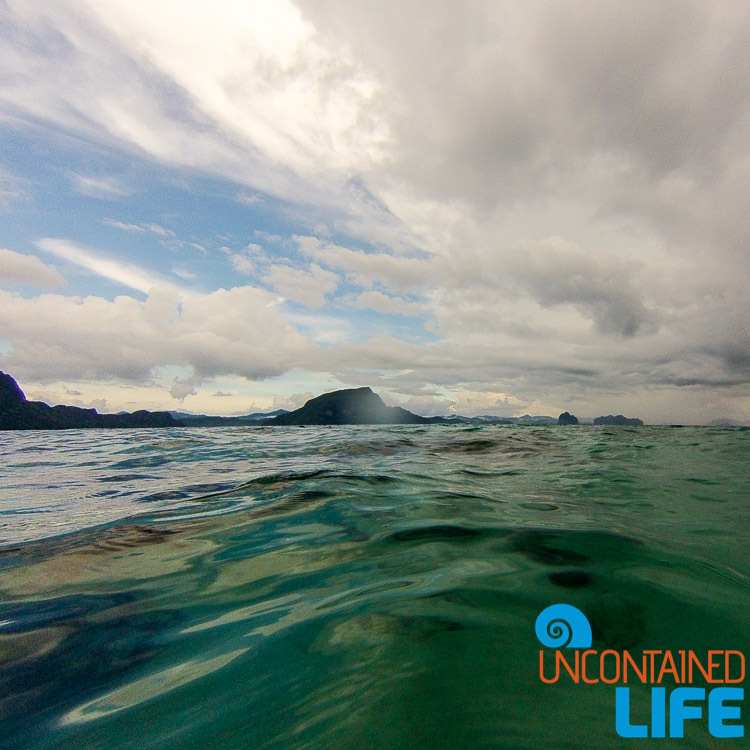 As we approached the island, storm clouds started to build, blocking out the sun and darkening the water. That didn’t stop us, though! 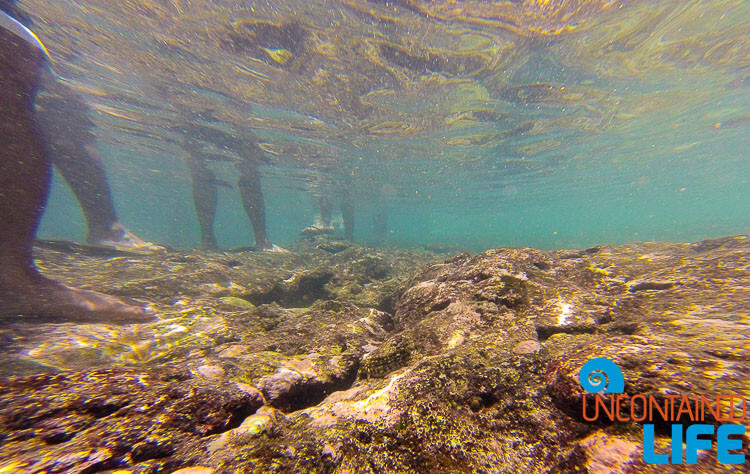 Into the water we plunged, and were rewarded with the best snorkeling of the day! If the trip had to draw to an end, this really was the way to end on a high note! 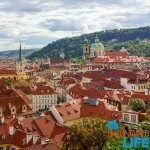 Reflections on Our Tour: Did it Live Up to the Hype? 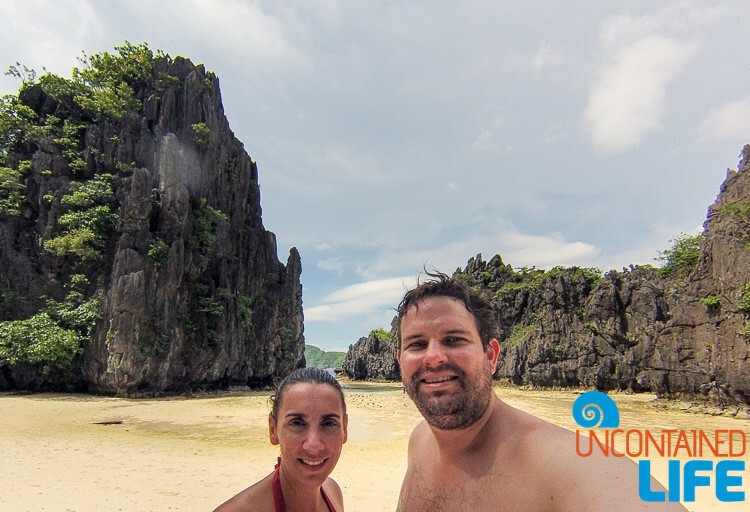 We made it back to El Nido before the rain, and stopped in for dinner at the popular Art Cafe. Over pizza and smoothies, we talked about our adventure. 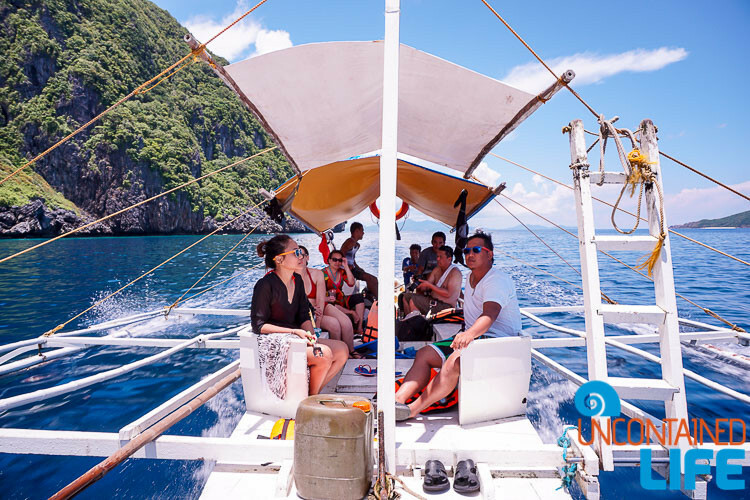 Our final consensus: island hopping in El Nido may be the touristy thing to do, but it’s still a pretty cool way to spend a day. 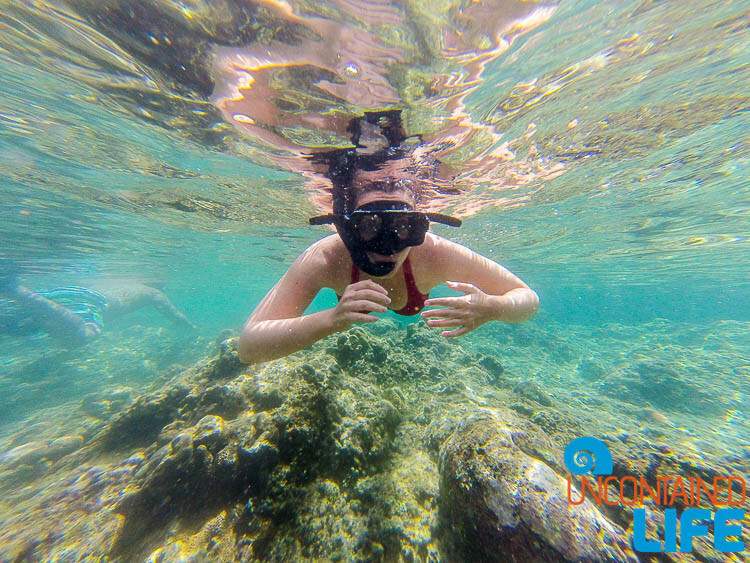 We did agree that the snorkeling wasn’t as great as we had expected–certainly not on par with what you can see in some other places around the world. But given that there are so many other gorgeous sights to see on the tour, we didn’t feel like we’d wasted our time. 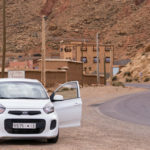 We both also agreed that we were very happy we’d chosen to tour with Alexzus Travels and Tours—based on some of the less-than-interactive behavior we saw from some other guides, it’s clear to us that really care about providing the best possible experience for their customers. 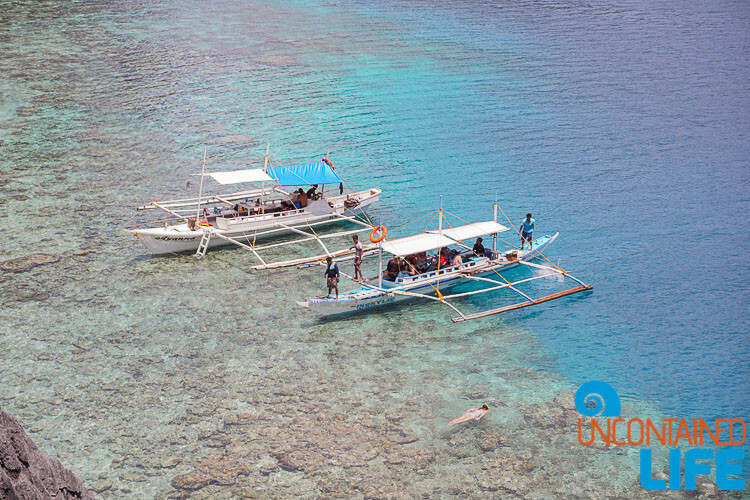 The only negatives about the tour really had less to do with the actual tour itself and more with the observed effects of mass tourism upon the reefs. 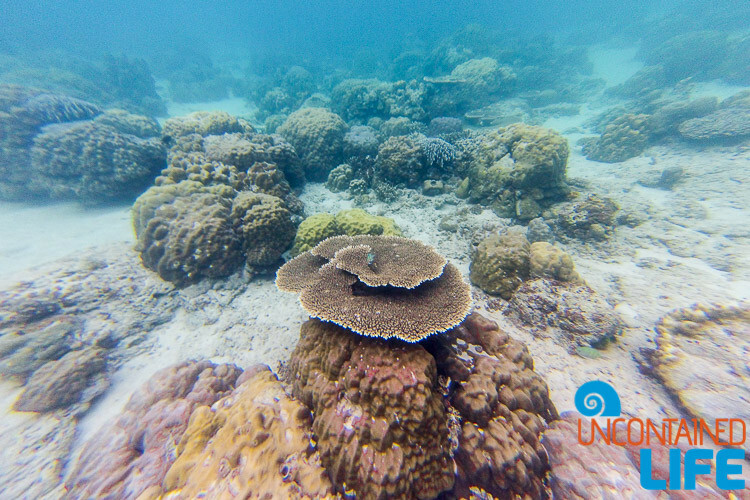 There is a LOT of dead and damaged coral our there, and based on what we saw, it’s clear that local conservation efforts have yet to turn the tide on that destruction. 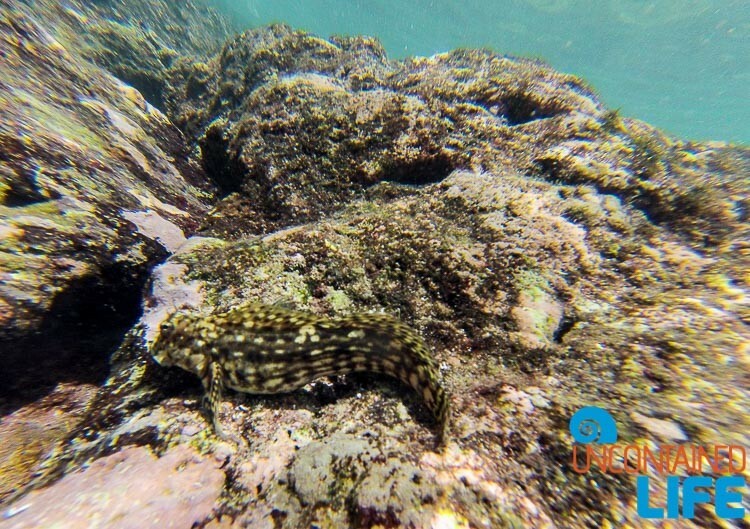 As we mentioned before, one major contributor to the problem is people stepping indiscriminately on living reefs. 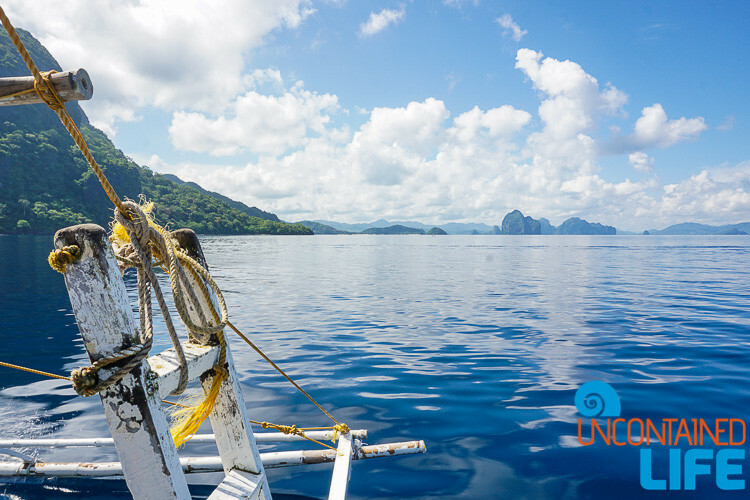 Luckily this is the sort of thing that any visitor to El Nido can help solve! 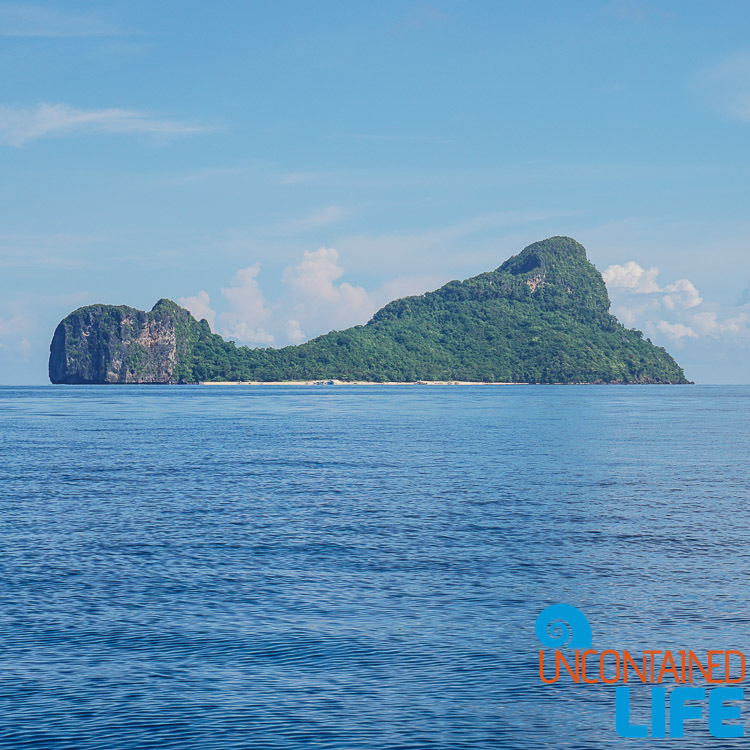 If you’re planning a trip to El Nido, we encourage you to take a few minutes to educate yourselves about what live vs. dead coral looks like before going island hopping. * After that, sit back, relax, and enjoy your time in paradise! 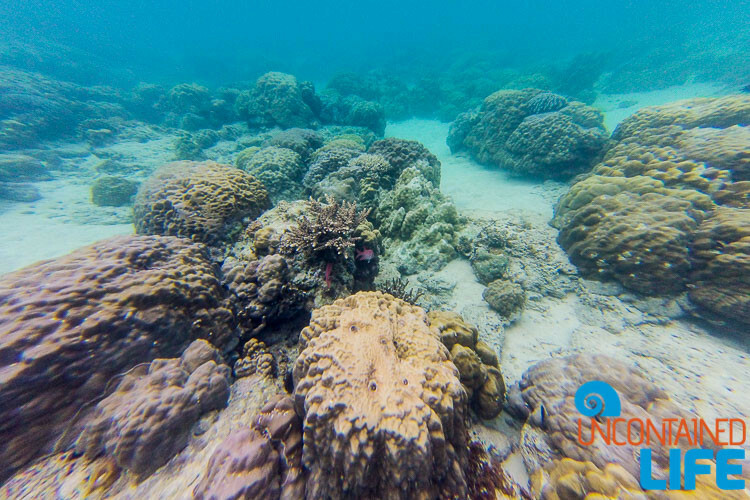 *For one example of live vs. dead coral check out this quick video which shows side by side images from Aruba–a spot which, like En Nido is struggling to balance tourism with conservation efforts. 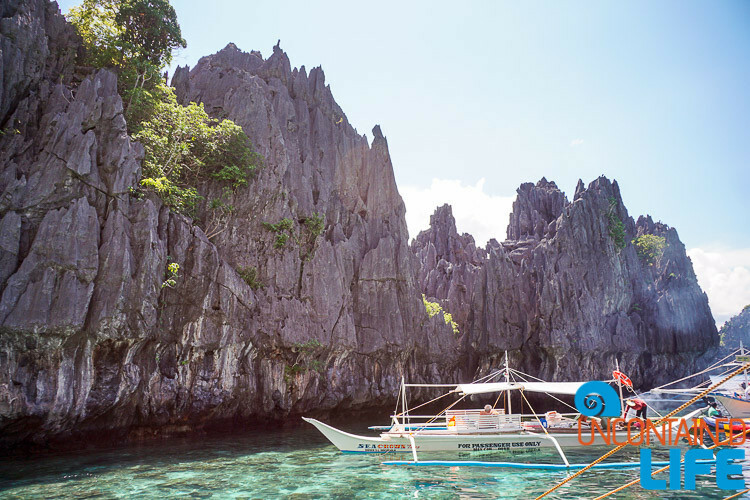 Currency: In El Nido, you’ll be using the Philippine Peso. ($1 USD = approx. 46 pesos). 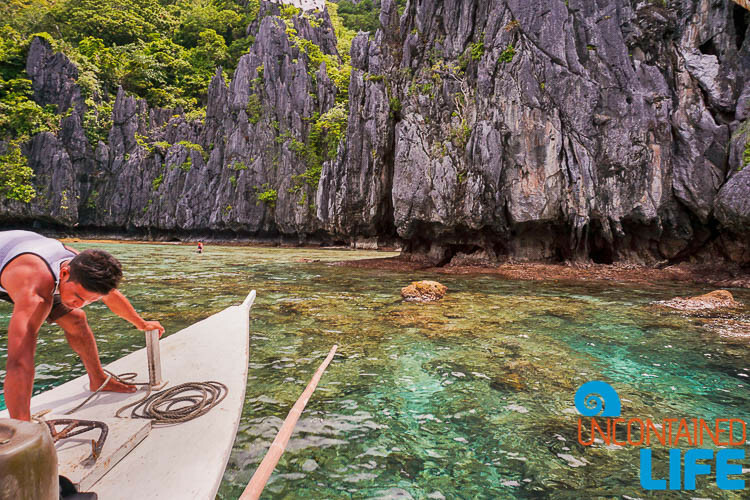 Note: There are no, I repeat NO ATMs accessible to non-locals in El Nido. 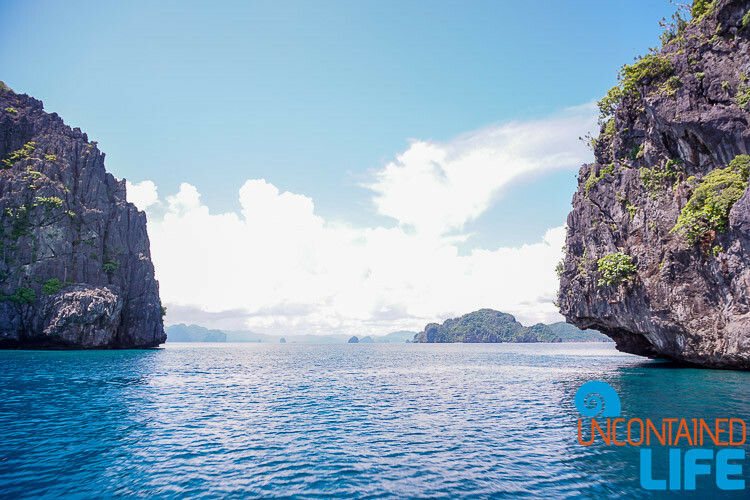 Bring enough cash for your entire trip or be prepared to wire extra cash to yourself using Xero. 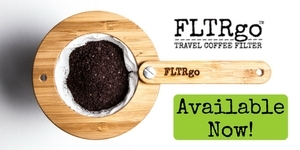 We recommend option 2 for most travelers. 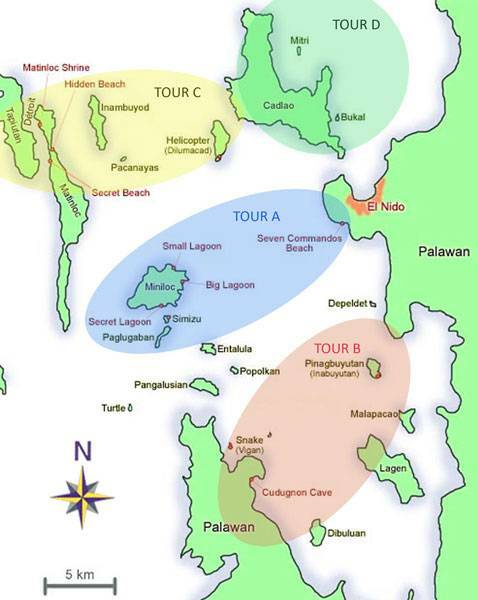 Given the mixed state of the roads between Puerto and El Nido, and the unique driving “style” popular in Palawan (I.E. 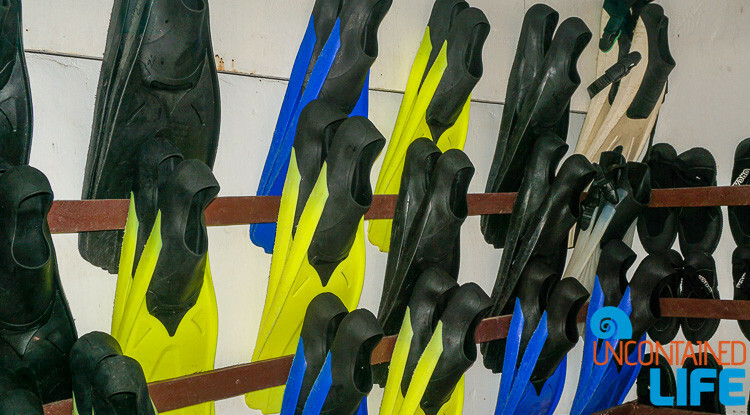 anything goes), we only suggest option 1 if you’re a very experienced and persevering sort of rider/ driver. 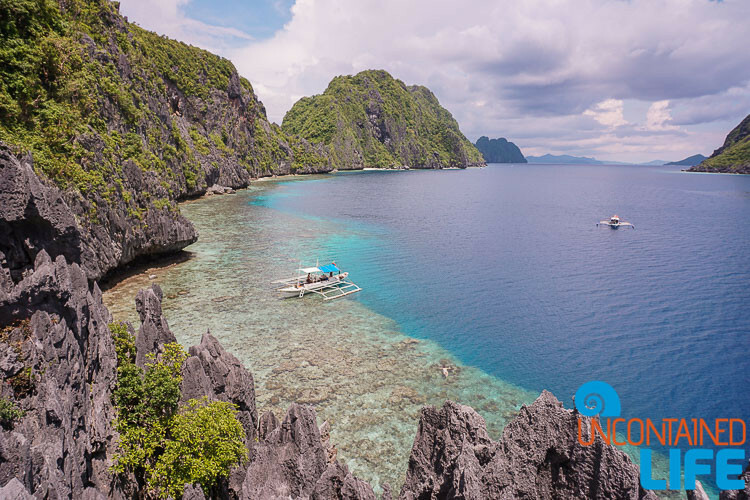 Option 3 will probably get you to El Nido in the best time, but vans tend to be cramped and expensive (not to mention, reckless driving is a major problem amongst van drivers). The buses are a little slower (since they do make stops along the way to pick up and drop off passengers) but they are less expensive (Air con Cherry Buses, which tend to be newer and in better condition than Roro, cost 450 pesos/pax), offer greater comfort, include free wifi (air con buses only), and are considerably safer than the vans in the case of an accident (which do happen with an unfortunate degree of regularity along this route). 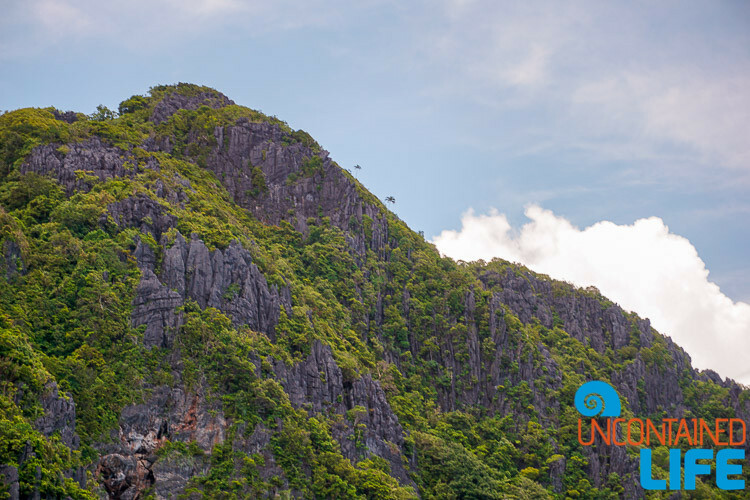 –Getting Around El Nido: TukTuks abound and can take you anywhere you want to go. Be sure to negotiate with drivers to obtain a fair rate. Also, always confirm the quoted price is for your ENTIRE party, not per person before your ride begins. –Dorm: Backpacker favorite Our Melting Pot Hostel is the perfect option for those looking for an inexpensive dorm bed (a couple of very basic private rooms are also available) right in the middle of town. You won’t find R&R here, but if you’re socially-minded, you’ll have great fun. Check prices on Agoda.com to save 50% or more! 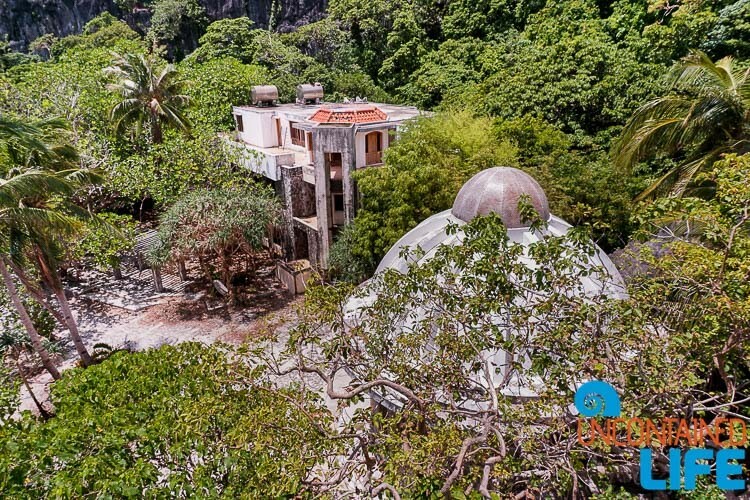 –Budget: For a bit of peace and quiet without the high prices, we definitely recommend St. John’s Island View Pension in Carong Carong. Rooms aren’t fancy, but they are clean, comfortable, and come with a nice basic breakfast each morning. Plus, the hotel is right around the corner from Republica Sunset Bar (who can ask for anything more?) Check your travel dates on Agoda.com to save up to 50%! 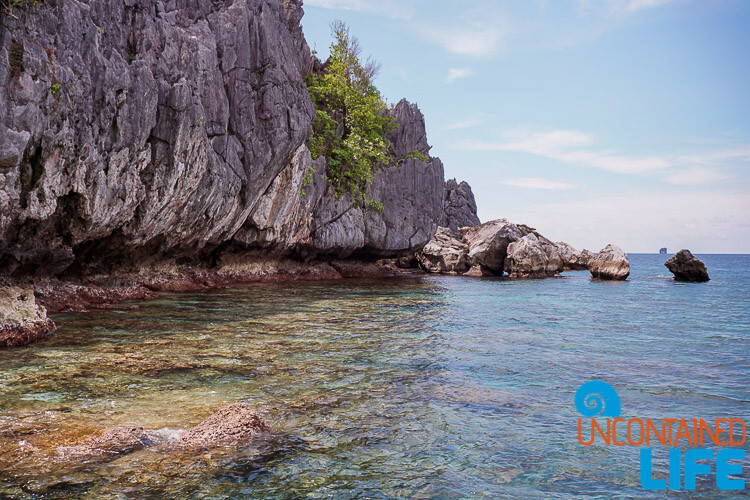 –Mid-range: Last Frontier Beach Resort is a newer, beach-front hotel in Carong Carong which features six spacious private bungalows at good prices. Staff are excellent and a simple, but delicious breakfast is included with your room (you can order additional items a la carte if you have a big appetite). Check prices now at Agoda.com and save 25% or more! 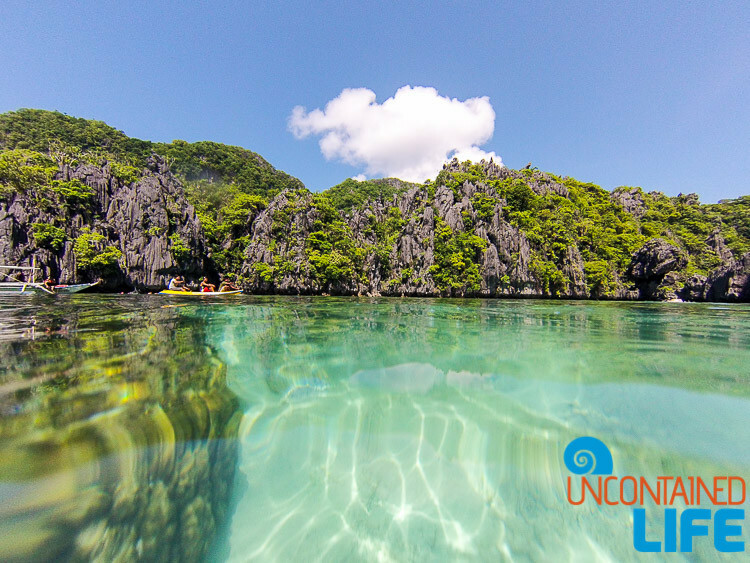 –Luxe: For those looking for a romantic getaway, Vellago Resort on Seven Commando Beach is waiting for you! 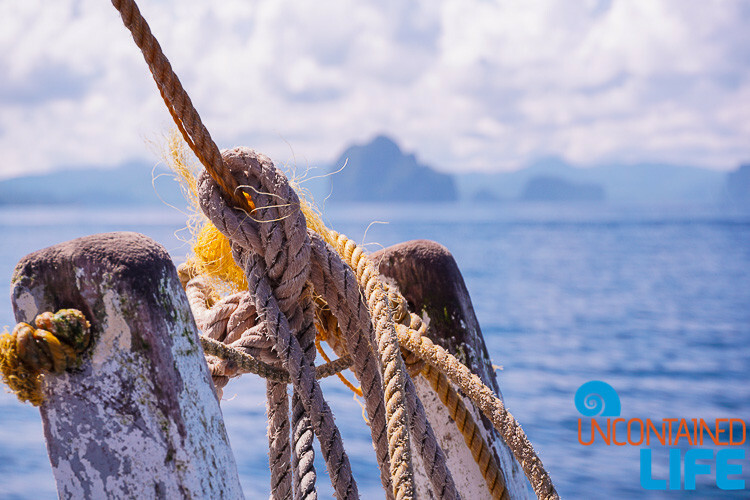 With just four beautiful rooms–each of which comes with a spacious ocean-view balcony–and a delicious breakfast (which you can eat, on your balcony!) 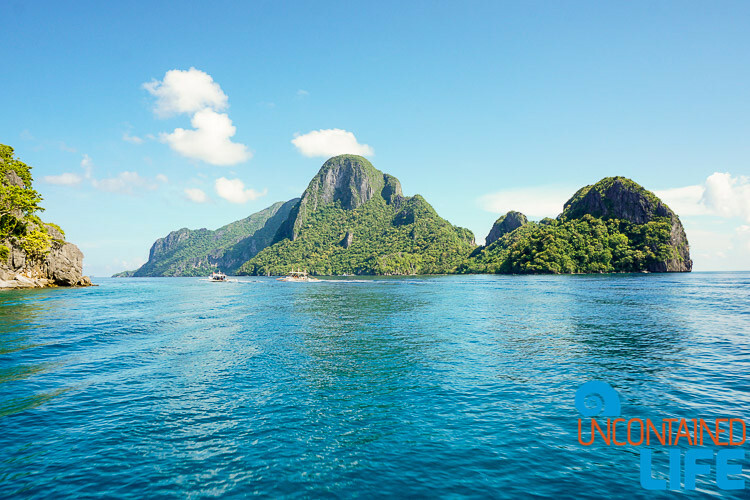 you’ll really be feeling the island bliss. 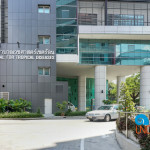 Check your dates at Agoda.com and save 60% or more! 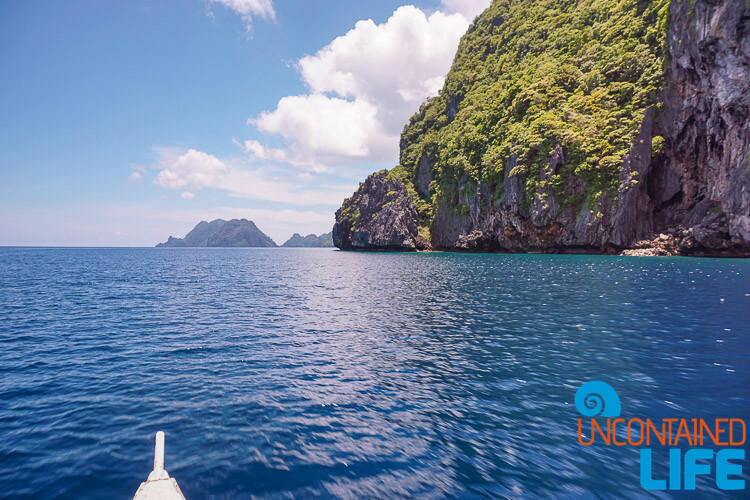 We highly recommend you come to El Nido armed with a quality dry bag, and a GoPro for all your water-based adventures (including the occasional tropical thunderstorm). 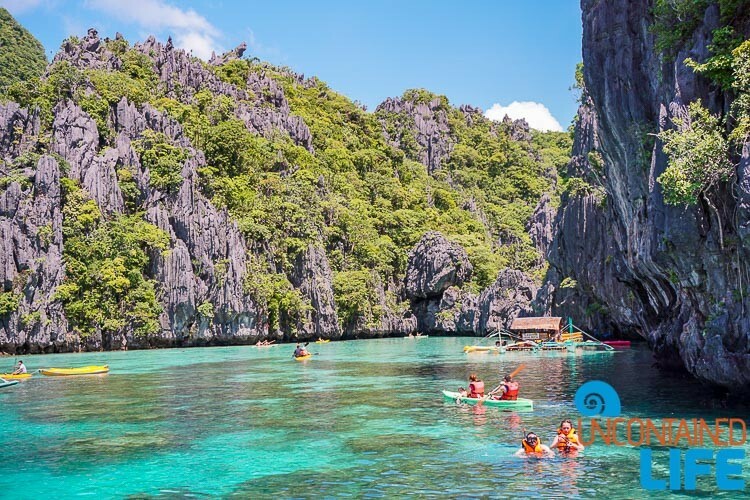 Cost of Island Hopping Tours and Related Expenses: Whichever company you book through, the cost for each of the four possible island tours seems to be pretty standard: Tour A = 1,200 pesos; Tour B = 1,300 pesos; Tour C = 1,400 pesos; Tour D = 1,200 pesos.You will also have to pay a 200 peso environmental fee (keep your receipt: the fee covers up to ten days of activities on local islands and beaches). 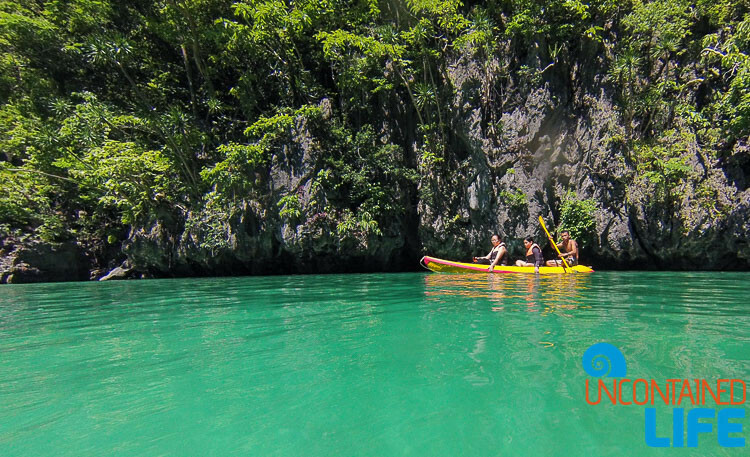 Tour prices include boat transportation, lunch and life jackets. 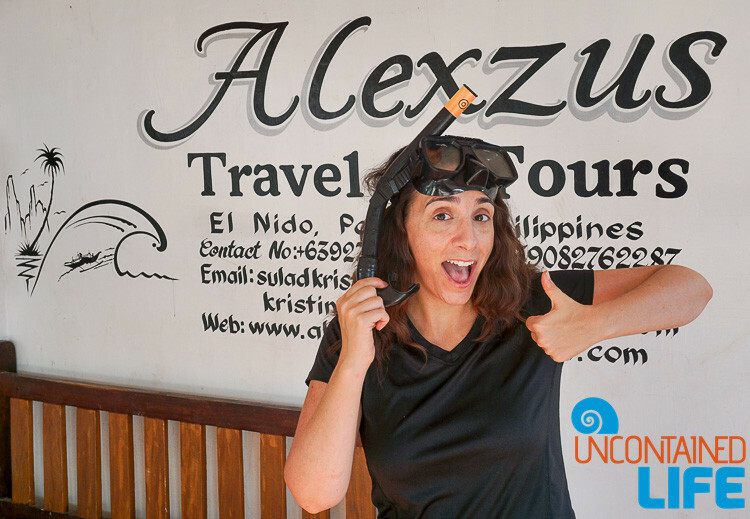 Many tour companies require you to pay a separate fee for your snorkel (usually around 200 pesos)—at Alexzus Travel and Tours it’s included in the tour price. 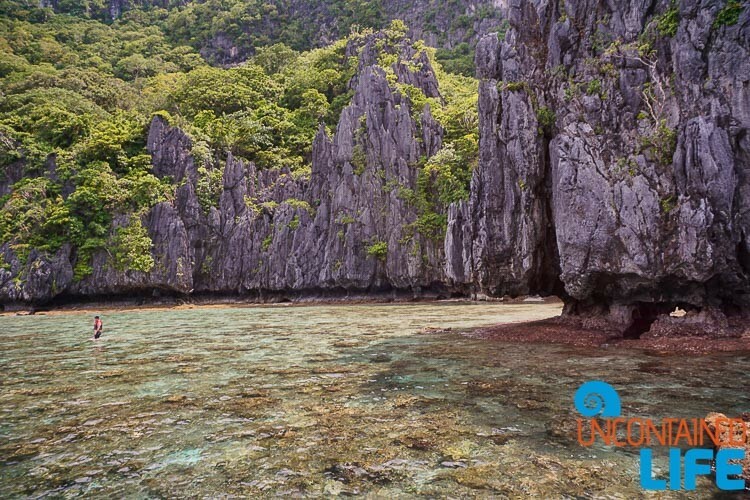 *Many thanks to Alexzus Travel and Tours for hosting us in El Nido. As always, all opinions are our own. 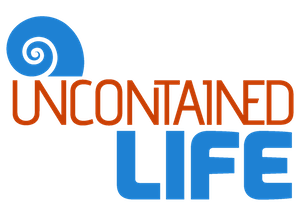 Uncontained Life only recommends companies, products and services that we have used ourselves and that we think are awesome.